The most instrumental stakeholders of hospital EHR success are undeniably nurses, yet 98% of licensed RN’s agree that they have never been included in hospital technology decisions or design. 13,650 US nurses, a group rarely surveyed as the prime users of inpatient technologies, responded to Black Book’s Q3 2014 EHR Loyalty Poll addressing the difficulties of systems selected by non-clinicians and the impact on patient care. Dissatisfaction with inpatient electronic health record systems among nurses has escalated to an all time high of 92%, according to the Q3 2014 Black Book EHR Loyalty survey results to be published later this month. Disruption in productivity and workflow has also negatively influenced job dissatisfaction according to nurses in 84% of US Hospitals. 85% of nurses state they are struggling with continually flawed EHR systems and 88% blame financial administrators and CIOs for selecting low perfomance systems based on EHR pricing, government incentives and cutting corners at the expense of quality of care.. 84% of nursing administrators in not-for-profit hospitals, and 97% of nursing administrators in for-profit hospitals confirm that the impact on nurses’ workloads including the efficient flow of direct patient care duties were not considered highly enough in their administration's final EHR selection decision. Black Book polled nearly 14,000 licensed registered nurses from forty states, all utilizing implemented hospital EHRs over the last six months. Survey respondents also ranked the vendor performance of nineteen inpatient EHR systems from a nursing satisfaction perspective. 90% of EHR nursing users attested that the use of the current EHR system in their facility has negatively impacted communications between nurses and their patients. 94% of nurses do not believe that the use of their current EHR has improved the communication between the nurse and the care team (physicians, respiratory therapists, physical therapists, occupational therapists, pharmacists, etc.). 51% of nurses working in hospitals with greater than 100 beds report that all care team members at their organization access and document on the same EHR screens. 30% of nurses believe their hospitals’ IT departments and administrations respond quickly to making changes in the EHR that the nurses recognize as vulnerabilities in documentation. Alarmingly, 69% of nurses in for-profit inpatient settings report their IT department as “incompetent” when describing the level of expertise their organization’s in-house staff has working with the selected EHR software. Nurses working in for-profit, chain facilities are the most exasperated. 98% are dissatisfied with the time allowed to be spent with patients versus the time allowed to document on the myriad of electronic medical record and departmental programs with no connectivity that their hospitals have accumulated. “Add to that the unique software interfaces from medical equipment and the multiple EMRs each individual physician’s office, it’s no surprise that hospital nurses are getting discouraged and seeking employment in less complex organizations,” said Brown. 79% of job seeking registered nurses reported that the reputation of the hospital’s EHR system is a top three consideration in their choice of where they will work. Nurses in the 22 largest metropolitan statistical areas are most satisfied with the usability of Cerner, McKesson, NextGen and Epic Systems. Those EHRs receiving the lowest satisfaction scores by nurses include Meditech, Allscripts, eClinicalWorks and HCare. A lack of IT resources is also impacting nursing productivity. 93% of nurses in for-profit facilities stated they do not have computers in each room or hand-held/mobile devices to aid in the EHR requirements. 91% state they have difficulty even locating an available EHR workstation on wheels at their for-profit hospital job which, in turn, takes time away from patient care. 35% of nurses in not-for-profit hospitals have a similar situation of not enough devices. Within for-profit hospital facilities, just 15% of the surveyed nurse respondents believed the IT department that supports the EHR are knowledgeable and receptive to nurses’ suggestions in improving electronic documentation. Among those hospitals outsourcing the EHR help desk, 88% of nurses reported that their experiences with EHR’s call center do not meet their expectations of communication skills and knowledge of product. 98% of those directed to offshore help desks report their EHR problems being typically unresolved and that suggestions for improvement were never given consideration. Current users ranked Cerner as the most nurse user-friendly inpatient EHR vendor, particularly in interoperability with ancillary and physician EHRs. Other vendors in the study included: Siemens, McKesson, Epic Systems, Allscripts, CPSI, GE Healthcare, NextGen, Meditech, Quadramed, HMS, HCS, RazorInsights, 3M, HCare, Vista, Healthland, Prognocis and eClinicalWorks. 67% of nurses reported they have been taught workarounds to allow other health team members to view pertinent information related to a patient, as to not lower the quality of care, yet avoiding the EHR systems’ unresolved flaws. Among the EHR vendors ranked lowest in nursing satisfaction, 89% of nurses report developing creative workarounds to deal with shortcomings and system deficiencies that are not addressed or corrected after reporting issues to IT and nursing supervisors. 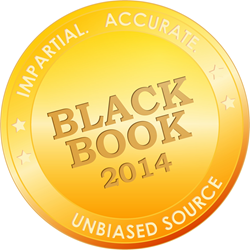 Black Book Rankings, a division of Black Book Market Research LLC, provides healthcare decision makers, IT users, media, investors, analysts, quality minded vendors, and prospective software system buyers, pharmaceutical manufacturers, and other interested sectors of the clinical technology industry with comprehensive comparison data of the industry's top respected and competitively performing technology and managed services vendors in the sector.